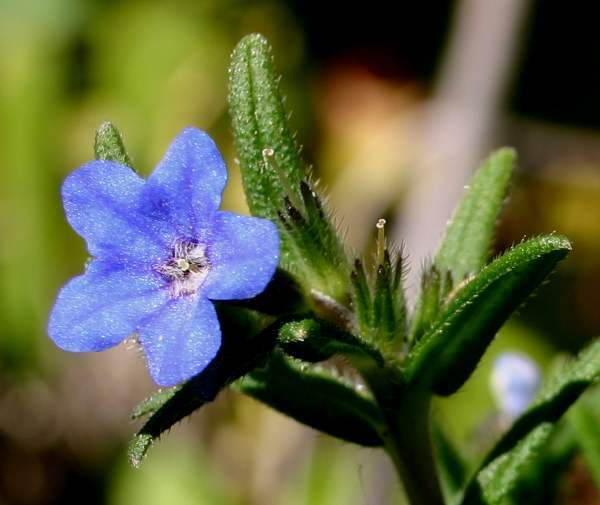 In countries where it is a native wildflower Shrubby Gromwell, a member of the Borage family, produces flowers for at least half of the year, which makes it extremely popular with bees. It is popular in gardens in the UK, where this very hardy shrub blooms for even longer thanit does in Mediterranean countries. 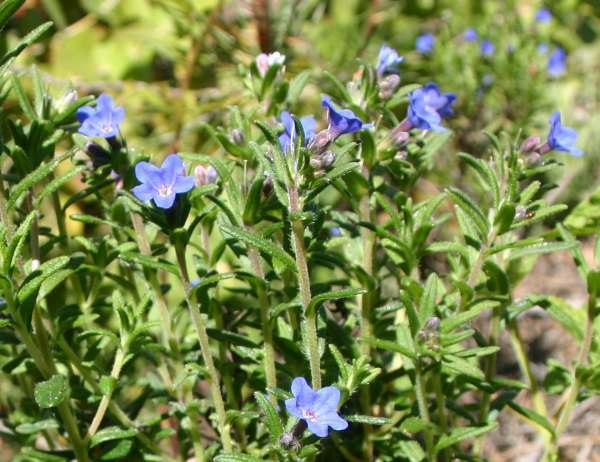 Shrubby Gromwell usually grows to a height of 20 to 60 cm and forms a densely branching shrub Young green stems are finely hairy, while older ones are brown with peeling grey-brown bark. The narrow stalkless leaves are alternate, typically 20 to 25mm longand covered in flattened fine hairs; their shiny green upper surfaces usually have small raised tubercules near their outer edges. The blue or violet-blue shallow bell-like flowers are typically 12 to 18mm long with five conjoined lobes forming the corola. In the Mediterranean region Lithodora fruticosa can usually be seen at its best between early March and the begnning of June, but some flowers are usually in evidence from mid December through to at least the end of June. This low-growing shrub can be found throughout the Iberian Peninsula and in southern France, where it produces flowers from December through until June. 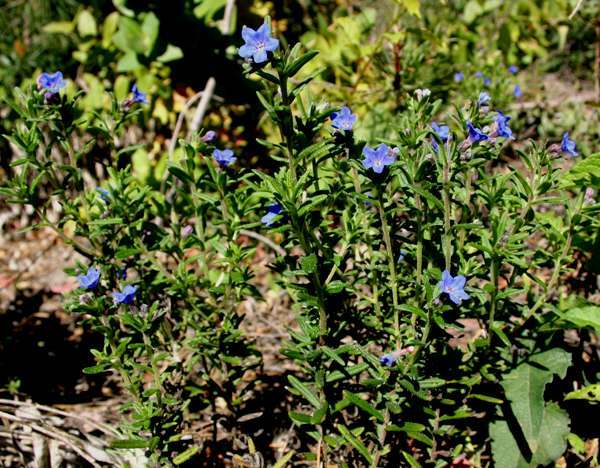 Shrubby Gromwell favours dry soil, often on the edge of pine woodland in hilly areas. The specimens shown on this page were photographed in the hills in the Algarve region of southern Portugal in March.